There is availability in this litter! Izzy is our beautiful mother. Izzy is one of the smartest girls I’ve had the pleasure of working with. She has great eye contact, loves people and other animals, and is outgoing and friendly. 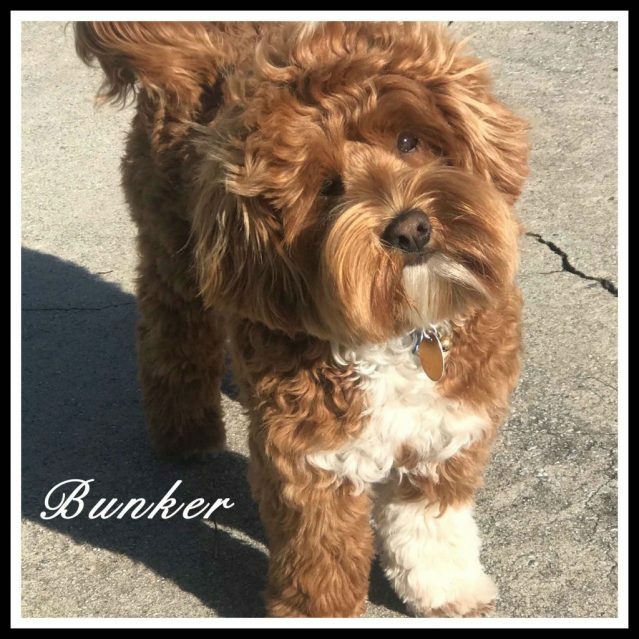 She is a gorgeous caramel, mini Multigenerational Australian Labradoodle with a beautiful fleece coat. Her height is 15 inches and weight is 14.4 pounds, a small mini. The sire is Souther Charms Who’s Your Caddy “Bunker”. He is mini ALD, 20 pounds and 15.5 inches tall, with health testing to the Gold Paw Standard of the ALAA and a wonderful temperament described as happy go lucky and devoted to humans. He is a gorgeous red doodle with white splashes. We put a lot of effort into choosing our dams and sires in order to produce offspring with great temperaments (extremely clever, sociable, comical and joyful) and superb genetic health. 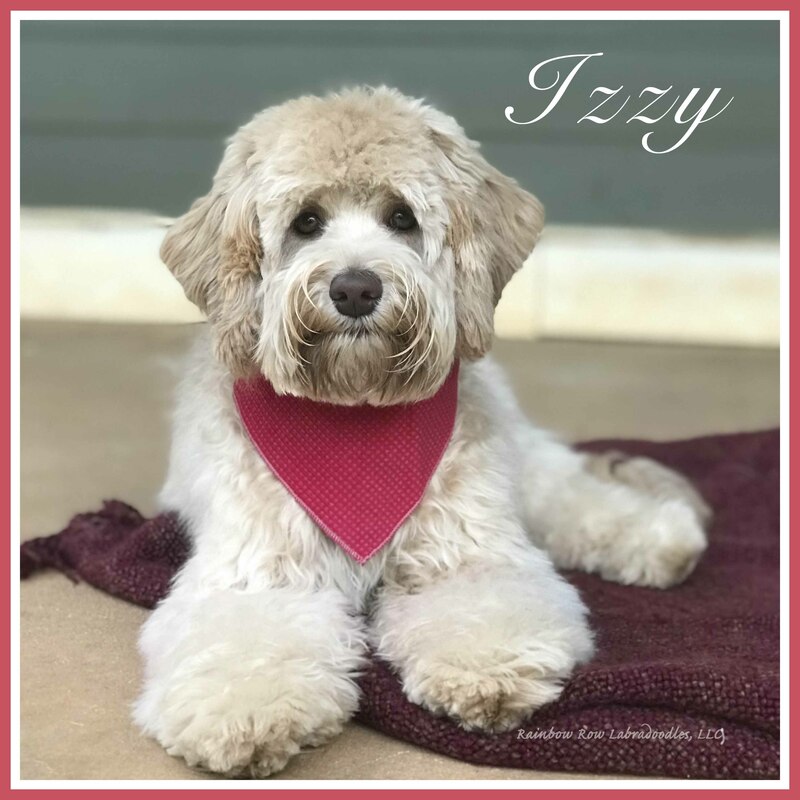 Please visit their individual pages or Our Doodles page for more information on each parent including testing (both passed to the Gold Paw level of testing through ALAA) and more pictures. We expect the puppies to be mini’s (15-25 pounds) in shades of apricot, red and caramel, some solid and some with white splashes. We will get a better estimate of each individual puppies size at 7 weeks of age. Both parents will be ALAA registered and tested to the Gold Paw standard and above. The Adoption Page has detailed information on the process to adopt. Please visit our Pictures Page and Blog for pictures of our previous litters. Call us at 843-754-2633 for immediate info. We will also be taking applications for a Guardian home for one puppy from this litter. There is availability in this litter! Nahla is our beautiful mother. She is very smart, intuitive, lovable and has eyes that are captivating and see straight to your soul. 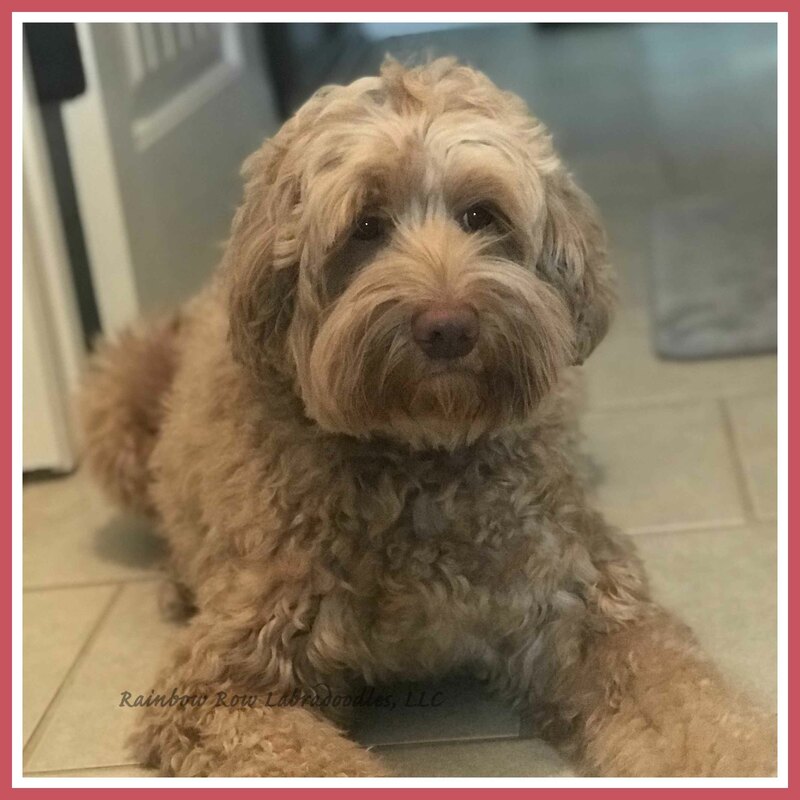 Nahla is a gorgeous caramel ice, medium Multigenerational Australian Labradoodle with a coat like butter! She is 17 inches and 24 pounds, which makes her a very small medium. The sire is Riverbends Work of Art aka “Artie”, a medium Australian Labradoodle. He is 18″ and estimated to be 29 pounds. He has a luscious caramel coat with white spotting. 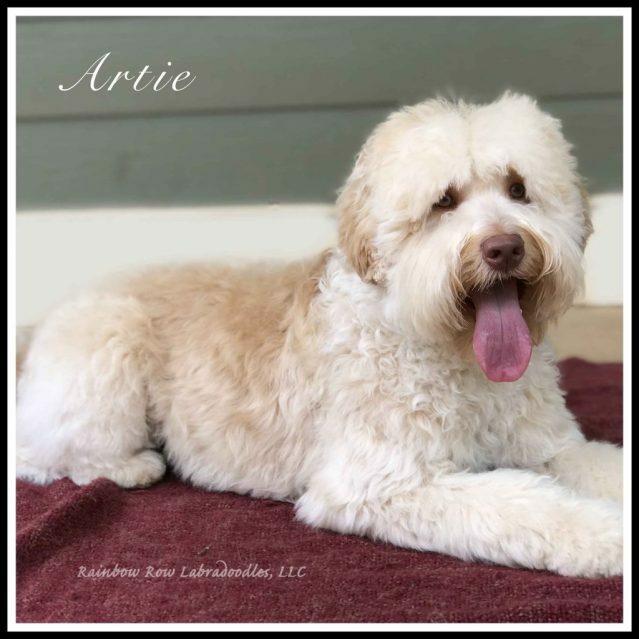 Artie is sweet, lovable, athletic, and smart. He has a gentle nature and love for people. His health testing is excellent and passed to the Gold Paw standard of ALAA and he has a rock solid temperament. We put a lot of effort into choosing our dams and sires in order to produce offspring with great temperaments (extremely clever, sociable, comical and joyful) and superb genetic health. 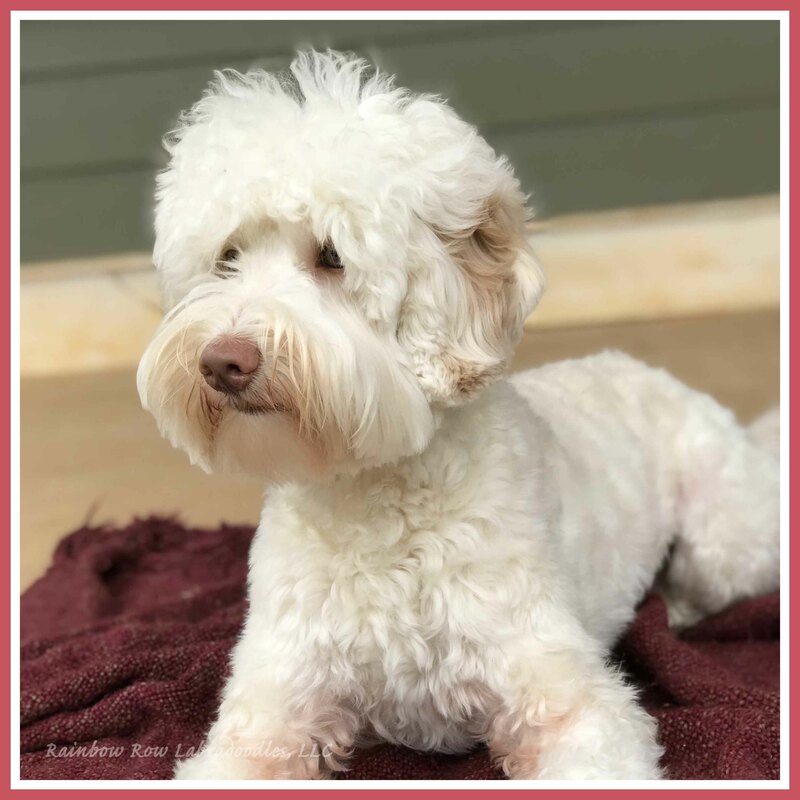 Please visit the Our Doodles page for more information on each parent including testing (both passed to the Gold Paw level of testing through ALAA) and more pictures. We expect the puppies to be small mediums (20-35 pounds) in shades of chocolate and caramel possibly with white markings. We will get a better estimate of each individual puppies size at 7 weeks of age. Both parents are ALAA registered and tested to the Gold Paw standard and above. The Adoption Page has detailed information on the process to adopt. Please visit our Pictures Page and Blog for pictures of our previous litters. Call us at 843-754-2633 for immediate info. We will also be taking applications for a Guardian home for one puppy from this litter.